Google Trends offers a vivid snapshot of post-Brexit U.K.
Few companies possess the ability to diagnose and articulate a nation’s reaction to current events quite as well as Google Inc., with today’s announcement that the U.K. would be leaving the European Union providing the latest example. Within hours of the news, which was soon followed by Prime Minister David Cameron announcing that he would be resigning in light of the results, British residents bombarded the search engine with questions regarding what had happened, how they could leave, and who Cameron’s successor would be, Google’s Trends team announced on June 24. 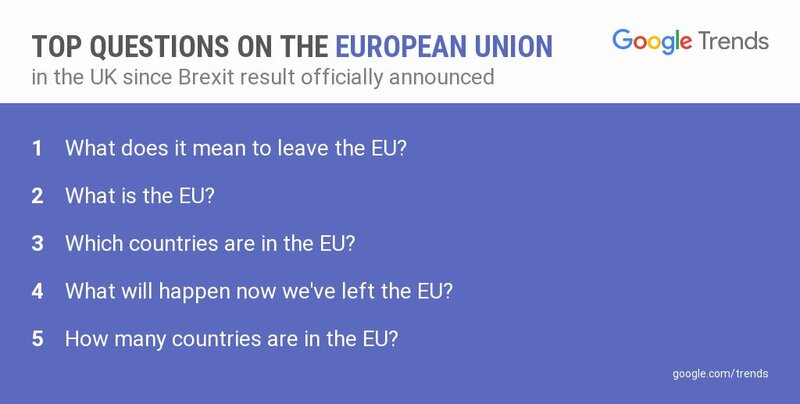 On Twitter, Google noted that the top global questions regarding the U.K. were all related to the so-called “Brexit” referendum, with users wondering when Britain had joined the E.U. (1973, according to the top search result, though it first applied to join in 1961), why it left (discontent with the scale of migration, according to the first news result, which in the eyes of many residents added excessive pressure to the country’s job market and public services; along with a general sense of contempt for the E.U. ), and what it means (nobody really knows because the situation itself is unprecedented, though plenty of outlets are happy to guess). British residents, meanwhile, took advantage of the opportunity to begin researching the E.U. itself, asking which countries were included (you can find the list here), how many (28), and what exactly 52 per cent of them had voted to leave (a post-World War II organization with origins in the European Coal and Steel Community, formed in 1951, and the European Economic Community, formed in 1958, with Belgium, France, West Germany, Italy, Luxembourg, and the Netherlands serving as the founding members of both – though the current version was established in 1993). As for what Brexit will mean for Canada’s tech industry, Google had an answer for that too, and it’s not pretty: 65 per cent of U.K. tech workers think the Brexit will have a negative impact on the global tech industry, according to a survey by U.K.-based Juniper Research, and even some U.S. tech giants, led by Microsoft Corp., have come out as anti-Brexit – though it’s worth noting that as of this writing, Google and Twitter have remained officially neutral in the debate. “Historically, the UK being part of the EU has been one of several important criteria that make it one of the most attractive places in Europe for the range of investments we have made,” Michel Van der Bel, CEO of Microsoft’s UK wrote in a May 17 blog post regarding the subject, noting that the U.K.’s E.U. membership allowed it to attract the best researchers from across Europe. “[T]he U.K. remaining in the EU supports important criteria for continued and future investment by Microsoft and others,” Van der Bel wrote.